Lisa Parkers career as an artist started the moment she was able to clutch a pencil confidently in her hand. Through her works she expresses her passion for nature, wildlife, and the mystical realm, bringing all three together in the images of each design she creates. Some of her greatest works are now available in the Lisa Parker Collection from the Anonymous Mint. The 5 oz Colorized Proof Lisa Parker Collection What Lies Within Silver Round is currently available to you for purchase online from JM Bullion. Rounds arrive inside of individual protective plastic capsules and feature a numbered Certificate of Authenticity! 2nd work of art to feature in the Lisa Parker Collection from Anonymous Mint! The obverse face of the rounds includes the What Lies Within design. On the reverse side of the rounds is Wild One from Parker. Individual serial numbers are found on each rounds edge! Artwork from Lisa Parker chosen by Julie Lindquist in the series! JM Bullion is the exclusive release partner for this series! The Anonymous Mints Julie Lindquist is the lead coin designer and takes on the task of selecting artwork from Lisa Parkers vast catalog of works. Lindquist selected the six rounds to feature in this collection and Italian master sculptor Luigi Badia hand-carved the blanks to use in striking the rounds in this collection. In the Lisa Parker Collection, Anonymous Mint offers silver rounds in two weights and three versions. In both the 1 oz and 5 oz silver rounds, Anonymous Mint offers proof, antique, and colorized proof versions of the designs offered. 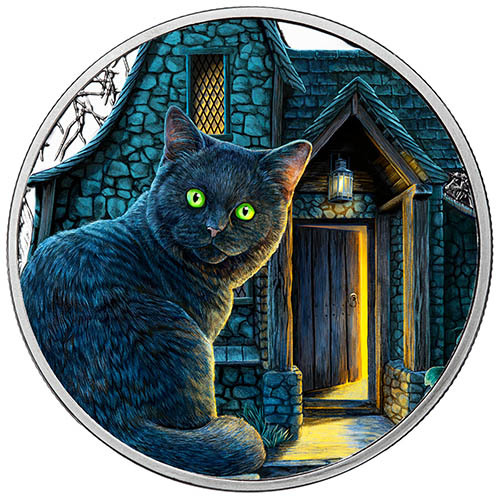 On the obverse of each 5 oz Colorized Proof Lisa Parker Collection What Lies Within Silver Round is the foreboding image of a cottage. The primary feature is a cat perched on a stone wall in the foreground. The feline sits looking back at you with dark fur and piercing green-yellow eyes. In the background, the door of a cottage is ajar and seems inviting, but the eerie glow from within and the haunting trees in the background suggest perhaps something sinister is afoot. The reverse of 5 oz Colorized Proof Lisa Parker Collection Silver Rounds includes the common design element. Wild One was created long ago by Parker and features on all rounds released in the Lisa Parker Collection. These 5 oz Colorized Proof Lisa Parker Collection What Lies Within Silver Rounds are available to you with protective plastic capsules and a numbered Certificate of Authenticity. This COA includes the distinct serial number found on the edge of each round. We encourage JM Bullion customers to reach out to us with questions at 800-276-6508 as they buy silver. You can also connect with our team members on the web using our live chat and email address features.